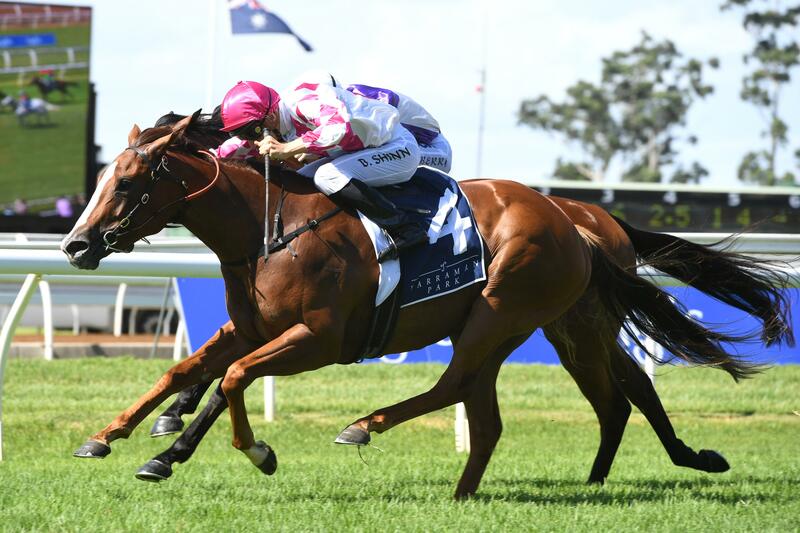 The Bjorn Baker-trained Champagne Cuddles broke through the $1 million mark with an overdue win in Saturday’s Group II Breeders’ Classic (1200m) at Warwick Farm. It may have only been her fourth career victory – and first in nine months – but by virtue of her consistency in high stakes races, Champagne Cuddles was able to reach the milestone at just her 16th start. Champagne Cuddles ($2.50 fav) stalked the leader Cool Passion ($5) before narrowly prevailing in an absorbing duel down the home straight to give Arrowfield sire Not A Single Doubt a stakes quinella. Winning jockey Blake Shinn, who has been in white-hot form since returning from a serious neck injury that sidelined him for the best part of six months, said Champagne Cuddles’ weight may have been the difference between first and second. “I thought she was well weighted with 55kg after being around the mark at Group I level,” Shinn said. “Cool Passion is a tough mare, but Champagne Cuddles is equally as tough and was up for the challenge. She did a great job to win. Trainer Bjorn Baker said he would wait before deciding which upcoming races Champagne Cuddles will target but has a wealth of options including the Group I Coolmore Classic (1500m) at Rosehill in a month. The four-year-old mare missed last year’s autumn carnival after undergoing surgery to have bone chips removed from a fetlock joint.